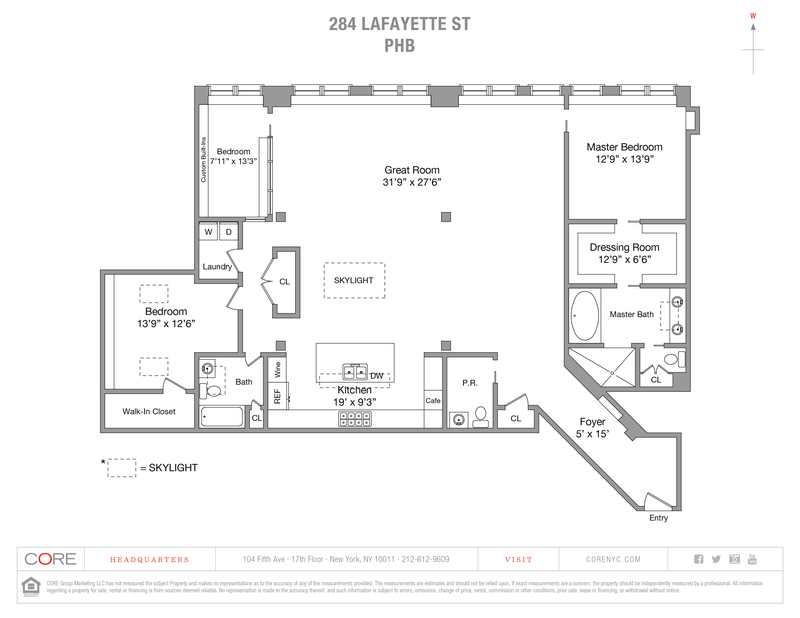 Take a peek inside PHB at 284 Lafayette, a dream-worthy pre-war loft with no detail missed. Stripped down to the studs in 2014, the loft has undergone a state-of-the-art renovation including brand new HVAC, electrical, plumbing and mechanical systems. Gachot Studios, a Soho based multi-disciplinary design firm known for projects such as the Shinola Store, Acme, and Royal Palms Shuffleboard Club, oversaw this timeless yet radical transformation. Enter the 2,500-square foot loft through an unassuming matte black door and within moments of entering through the 15-foot entry gallery, the feeling of home is everywhere. Optimally situated on the top floor of a six-story building, PHB offers 12 arched-windows facing west over Crosby Street and six new skylights allowing for unlimited natural light, from morning to night. 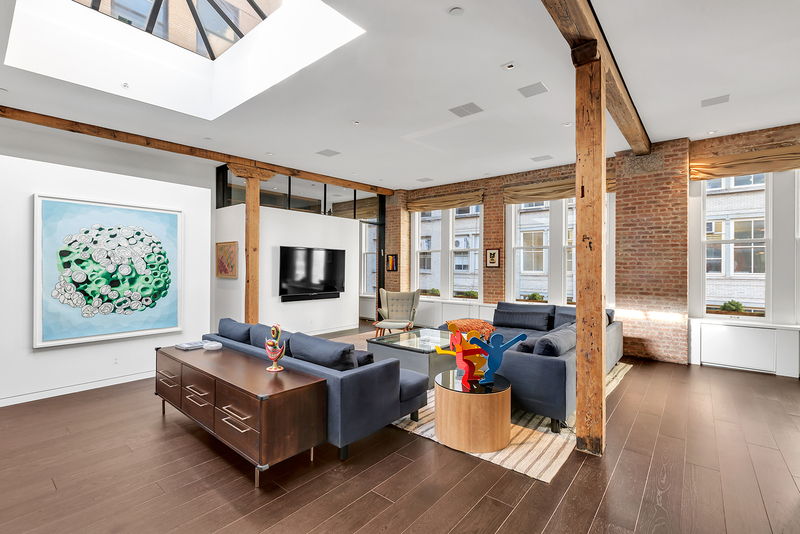 The loft spans 57 feet wide, has three bedrooms, two and a half bathrooms, a massive great room with three distinct entertaining areas, 11.6-foot ceilings and beautifully restored wooden beams and columns. Seven-inch oak floors and custom millwork amplify the loft’s warmth and style, creating an inviting yet refined aesthetic. The open but setback kitchen is a room of its own and is outfitted with fumed, rift cut oak cabinetry, reflective upper cabinet doors made with etched glass, absolute black granite countertops on the island and backsplash, bronze pulls and a high end appliance package. A large, operable skylight, vented hood and in-sink garbage disposal complete the list of elements that rarely exist in a pre-war kitchen. The master bedroom is comfortable, bright and precisely laid out. The sleeping area and the walk-in closet are dream spaces filled with incredible millwork and never ending storage. Materials like white oak, limestone and raw red brick flow throughout the bathroom which features a walk-in steam shower, custom steel door enclosure, a deep soaking tub for two, a beamed skylight and a stunning double vanity. The second bedroom is currently used as a library and features floor-to-ceiling oak and steel bookshelves, a sliding ladder and a secret swing door that leads to a semi-private exit stairwell. The third bedroom has two large operable skylights, a massive walk-in closet, exposed brick and a dedicated full bathroom with a bathtub and linen closet. Two more closets, a brick foyer and the stunning powder room are additional components of this masterful loft floor plan. Designed with all of the comforts and conveniences expected in a luxury home today, PHB offers five-zone central cooling and heating with humidification, Crestron home automation system, in-unit vented laundry and brand new landmark approved windows.